Budapest deserves her reputation as European spa capital. The country sits on a reservoir of hot water and around three million litres burst through the surface every day by means of natural springs and drilled wells. No wonder the city has so many thermal baths with mineral rich healing waters to help all sorts of complaints from rheumatism and dodgy hearts to spine problems and skin conditions. Throughout history many crowned heads used Budapest’s stylish spa facilities, among them Hungarian Kings Sigismund and Ludwig and our very own King Edward VIII. The medicinal spring waters are hot – usually over 30oC - and sometimes people combine a dip, (anything from fifteen minutes to four hours), with a healing massage. 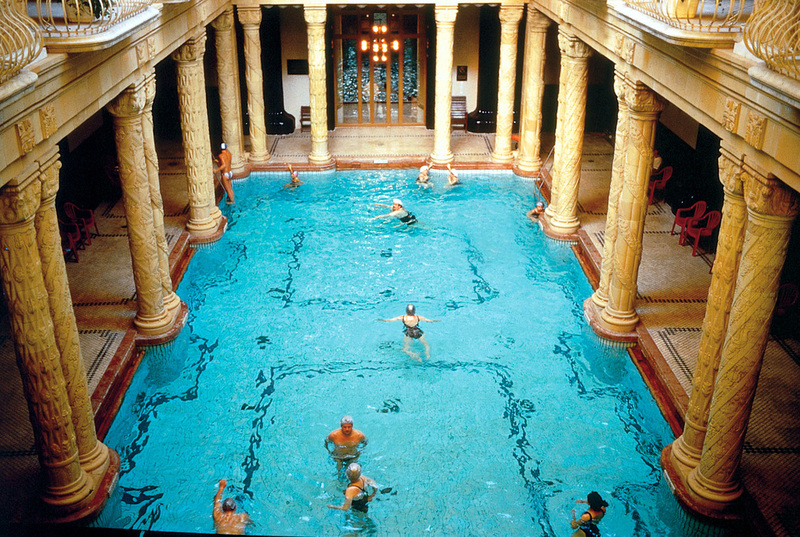 The Rudas Thermal Baths (1013 Döbrentei tér 9) reopened a new years ago after extensive renovation and with a revolutionary new admission policy. The atmospheric Turkish section, for centuries a men-only domain, is now open to women. On Friday and Saturday nights, these baths welcome bathers of both sexes - provided they wear swimming costumes. One of Europe's largest bath complexes are the Széchenyi Baths (Állatkerti út 11) where the locals, mainly senior citizens, relax by sitting in the water playing chess. Built in renaissance style between 1909 and 1913, this is where, for an extra fee, patrons can enjoy pedicures, reflexology and a solarium. Palatinus Baths (Margaret Island) was the first to make outdoor bathing a reality. Its adventure pool is equipped with water jet massage, whirling corridor, neck showers and fountains. In 2013 the thermal pool had a four lane slide system added. A bonus is when using the slide, you can listen to music and admire the lights show. But on the other hand, if sitting for hours in spa water until your skin goes wrinkly doesn't appeal, why not choose the alternative route to better health? Drink glasses of the warm, sulphurous mineral water direct from source. Apparently it is excellent for tummy troubles, circulatory disorders, rheumatic diseases and premature ageing. You’ll need to hold your nose, be brave and swallow as fast as you can though. It tastes pretty awful.